I'm a soon to be 65 husband, father and grandfather. I've had to spend most of my life working in the home improvement sales business so I could have health insurance for my family and a safety net for my artistic endeavors. For years I supplemented my income by being a wedding and portrait photographer working out of my home. But when medical problems forced me to hang up my cameras I decided to return to my first love, art. I was well over 50 when I started doing house drawings and portraits. I was working in pen & ink and watercolor when my wife introduced me to colored pencils and I found my medium. I also found my favorite subject, alleys. My first alley work won "best of show" at a local college's Artfest. So I started hanging out in alleys armed with my 1.3 megapixel camera and a half-decent eye for interesting subject matter. 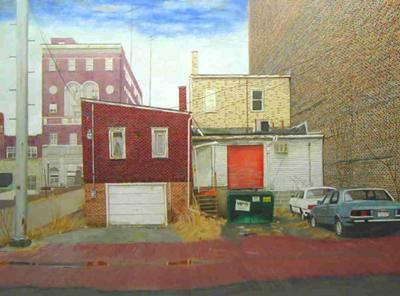 My wife says I do alleys because they won't let on the main streets but be that as it may I soon won another "best of show" for the body of my work instead of a particular piece. I haven't displayed my art anywhere other than that annual artfest which I don't do any more because of health problems. But I continue to work at my regular job and my art which I sell occasionally from my website and western drawings I sell on ebay. I still haven't given up hopes of being "discovered" some day but until then I'll keep drawing bricks and having a pretty good time while doing it. I stopped into Alliance today to visit the Troll Museum with my daughter - we are from New York City and were traveling in for the week. It is such a broken city - i wondered how it got that way. And found your pinterest as well as your own terrific sketches. Thanks for providing such excellent context - really love your art as well. Is there a place where you keep all of your scenic drawings on line? If so - please let me know at Marcgerald888@gmail.com. Love to see them. I like your painting very much. Keep painting and enjoying every brushstroke.